The 150gr VLDs did ok for the wind conditions but I'm not satisfied with those results yet. 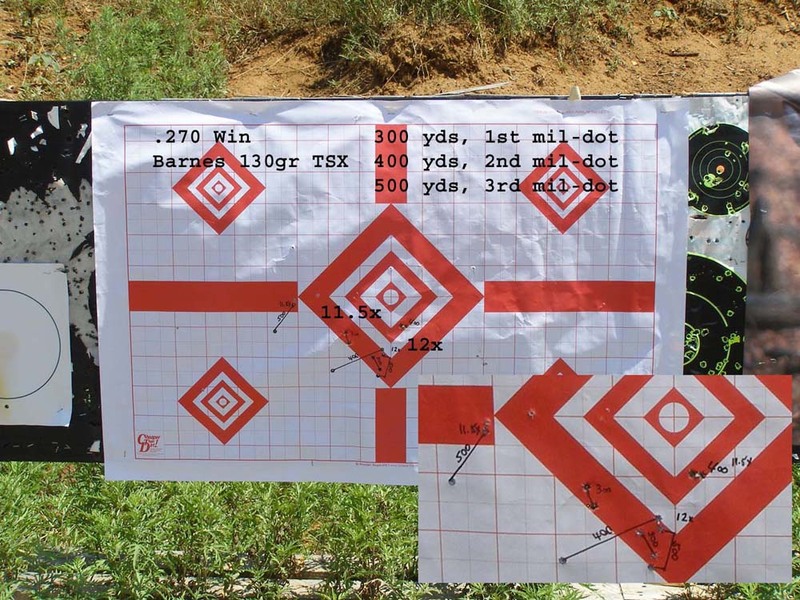 The 110gr TTSX hit low which caught me by surprise (300 highest, 500 lowest) so I went back and fired at a paper target at 400 and 500 yards using the mil dots. Despite being pushed right for the wind (4 to 7 inches) they were within 1.5 inches in elevation. One thing is consistent, I shoot smaller size groups when shooting at a lined paper target where there is a small precise aimpoint than I do when I'm shooting at a deer target. I definitely need more practice shooting at the vital area. When I got home I compared my measured bullet drop to the ballistic tables and found an anomoly. There is a mismatched at the longer ranges with the 110gr TTSX bullet. I need investigate this more. The velocity of the 150 gr VLD is signficantly slower and though it should carry this velocity better at longer ranges, I don't think I want to bother with that much hold over. I choose these too loads because they are at the extreme. Both my 130 loads are more consistent but I had a limited supply of bullets which is one reason I left them out this round. Next time out I'll work with these loads and see if I can obtain more satisfying performance. For now, it looks like I can do well out to 300 yards but need a lot more practice before 400 and 500 become valid options. I'm also questioning if I should go back to my original set-up of sighting in at 250 yards and using a reference card for mil-dot offset distances for the longer range. Had to take a day off from work or lose vacation so I headed back out to the range today. Rare for me to be back so soon as I was just there Friday. I wanted to get back out there and try a different approached to this long range challenge. First - only one load - not 2 or 4. Prevents mistakes when you forget to change a zero or adjust the scope power. Second, after ensuring a good 100-yard zero, I started shooting with the mil-dots at the target center vice cross-hairs on the center and measuring ballistic drop. Much easier process and it builds confidence right from the start. Typical, I learned some more. Here's how it went. Sighting in at 100 yards went well with the 130gr Barnes TSX. All groups were below 1 MOA. I was changing the zero from the 110gr TTSX used on Friday. My initial adjustment was down and left. Correction was 2 clicks up and 2 clicks right. I found out my expensive Bushnell 6500 does a 1/4-inch elevation per click but does about 3/4-inch per click for windage. I backed the 2 clicks for windage out and left the zero where you see it on the 3rd insert. Then I moved to the 300 yard line (resisting the urge to start at 500 and work in). I was confident in my groupings so only shot 2 rounds per range. Also, my barrel heats up enough after 2 rounds that I notice the affect on accuracy, especially when its 90F out. Going down and marking my target gave the barrel time to cool for the next yardage. With my known velocity from the chronograph and ballistic table data, I used the .xls spread sheet at the beginning of the post to determine 11.5x should match my mil-dots to my rifles trajectory. I set the scope on 12x because it was easier to reference then shot twice at 300, 400, and 500 yards using the first through 3rd mil-dot, respectively. The results gave me confidence in what I was doing unlike the previous process. Yes the group was low but it was a very well defined group. Wind was variable 7 to 10 mph from the rear. I did adjust the scope to 11.5x and shot 2 more from 500 yards. I liked the adjustment (the 2 shots on the left). The wind started to kick-up more and had a more significant crosswind component that was changing from side to side. First from the right side then the left. With this scope magnification adjustment (11.5x), I engaged the deer target at the 3 different ranges. I still need improvement compensating for the wind (500 yards wasn't enough and went right, the 300 and 400 were compensated too much). I feel this is the best I've done to date and feel confident I'll keep improving. Yes the impacts were still 2 to 3 inches low but the 1st mil-dot is really at 275 so 300 yards is a bit low to begin with and the ranges were a bit long which can make a difference, e.g., 300 was really at 307 yards, 400 was 409, and 500 was at 506 yards. At least this time, all the shots were in the kill zone and this is a small size deer target, 12 inches from top to bottom red line, center was my intended POI (note, the red hash marks were added at home with photoshop). keep us posted. I'm doing the same thing as you, cept the mil-dots, getting ready for my colorado mule deer hunt. lots of good info, thanks. W/ my 300 using 150gr Fed PS factory stuff I can shoot flat on at paper at 100 and 200y gongs/silohuettes, first dot for 300y gongs/silohuettes, second dot and a bit for 400y stuff but things are pretty inconsisntet from there and on out if there is ANY breeze and i cant run paper out past 200y. Point-Blank info from here and a spotter has helped some too. I LOVE my mil-dot scope. Thanks slimjim for the excellent work here. Great report. Now I've got to get out there and work on the trajectory vs magnification for a couple of my rifles too. Meanwhile, as the never-ending rains continue, I'll be cracking a beer in your honor. I just loaded up another 20 rounds. 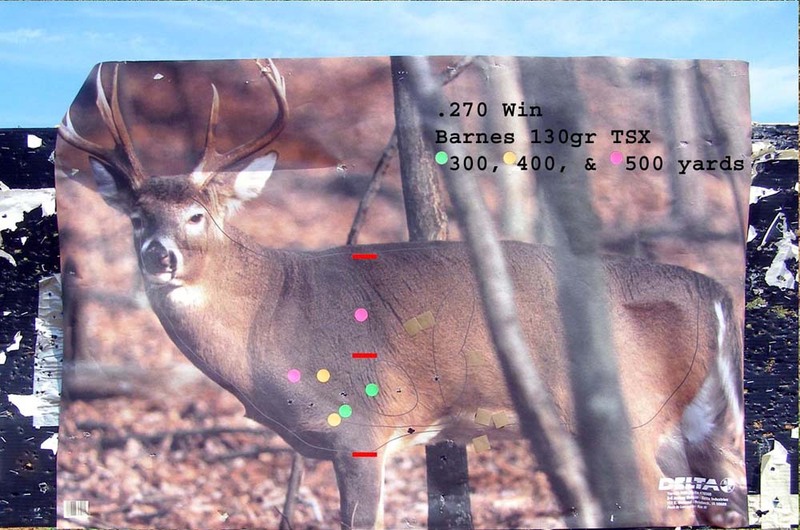 I'm going to go back out and repeat the same process using 11x and add in second deer target into the mix. I could stand to be shooting high for once and I'd like to figure out why my POI are lower on a deer target than a lined target. Oh, while I was reloading this morning, I spent some time taping up the holes in the first deer target I used when starting trying to extend my shoot range a year ago. It was an interesting contrast in dimished bullet spread that highlighted the improvements made. I'm going back up monday to finally try some loads I made in El Kabong. Gonna check for complete combustion, pressure signs then groups. BOOOOM! I'm going back up monday to finally try some loads I made in El Kabong. Have you considered this bullet? You have a 1 in 10 twist so you can stabilize the longer bullets that have the better wind-bucking balistic coeficients (0.648). The long-range 300Mag shooter speak highly of this bullet. Argh. Blocked here at work. I know of those though. After yesterdays recipe flop I'm going to try something else and/or start over. Dot scopes are nice, esp w/o a spotter. Takes a round or two more to get on target but it makes it easy to repeat once yer there. Got back to the range yesterday for some recoil therapy!!! It was a beautiful day. Sunny, upper 80s to lower 90s, and light winds. The winds stayed below 5 mph but came in every direction and constantly switching and changing velocity. Got to work more on using my Mil-Dot Reticle for bullet drop compensation. First, I finished out my target shooting at 11.5x. I liked the results but still a little bit low. Feel pretty confident I was close, I adjusted the scope to 11.25x (aligned with right side of the 2 in "12") and shot at the deer target at 300, 400, and 500 yards. I did the 500 yard shots first and liked the results. When I get confident from results like that, I shot for the heart at 300 and 400 yards. I have to stop doing that and stay focused on center of the lungs at that range. That would be the center red line or slightly above. BTW, the red lines are 6" apart and added to the image when I got home. 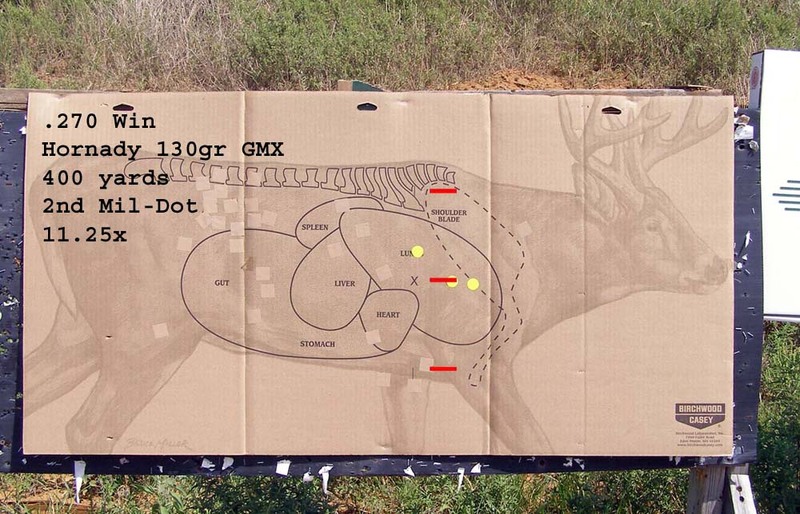 I wanted to see how my Hornady 130gr GMX load would do so set up at 400 yards, used the 3rd Mil-Dot and fired 3 shots. The POI is only one click off my 130gr TSXs so I left the scope alone. My barrel heats up too much after 2 rounds and starts to walk the POI slightly. That's why I usually only shoot 2 shots then let the barrel cool. I am fully confident in using my Mil-Dot reticle now for bullet drop compensation at long ranges. Now I need to keep practicing with the wind affects which I feel I can easily deal with at 300 yards. 400 yards might be ok right now but 500 yards definitely needs more practice. I tried this technique with my .223 AR and 77gr SMK (BC .362) in preparation for a tactical match. Using 23.6gr of Varget, I am getting 2700 fps. 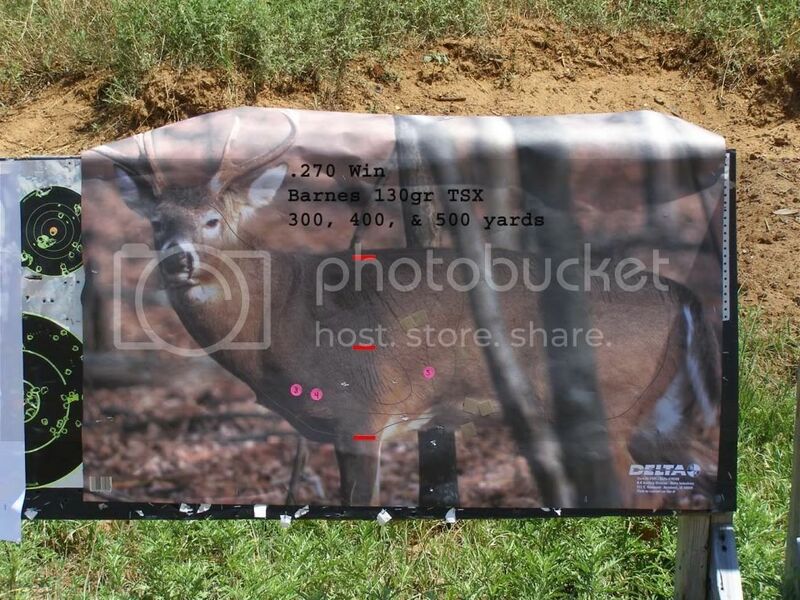 With a zero at 250 yards, the first mil-dot was 350, second was 450, and the third, 550 yards. This was on 10x which is the true mil-dot setting for my scope. I prefer not having to twist knobs in fast reaction situations so this works very well for me. What was also nice is my 55 FMJs were on at 50 and 200 yards so I used them for close-in work. 4-16 Mil-dot on my savage .223. I prepared a drop mil-dot chart at 15 power which what I used for prairiedogs. My zero was 300 yards. It worked very well for prairiedogs out to 450 yards. After that range the trigger man really sucked. You should do fine with yours. Just takes a little getting used to is all. This worked well for windage also. Currently I've gone to a dedicated .223 BDC reticlule on my lowwall .223 winchester, which I'm pleased to say works very well with 55 gr. vmax's. Have fun playing with your setup. As my hunting partner and I were preparing for our elk hunt coming up this weekend, we were out doing long range shooting with our mil-dots. At 500 yards, it was interesting to see his impacts 7 inches left of target center and mine were 4 inches right of target center. The wind was very light, left to right. This made me realize an important component of any long range shooting I hadn't fully considered. There was only one reason for hits were mismatched - scope orientation. Either a rifle was not being held perpendicular or a scope was off slightly in the rings. It doesn't take much at 500 yards. Next time I'm at the range, I'm going to do a test. I'm going to shoot two groups in a vertical string at 100 yards. 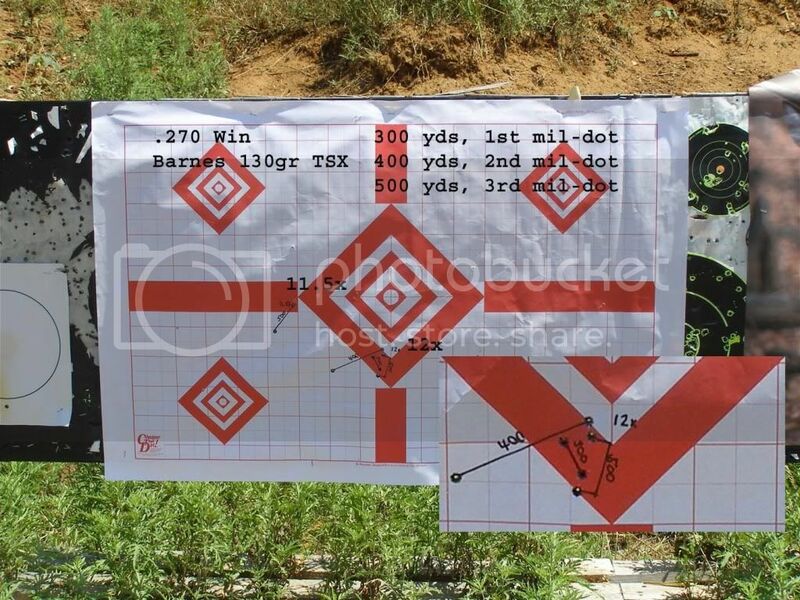 The first group will be at the bottom of the paper with the cross hairs (100 yard zero). The second group will use the lower mil-dot as the aiming reference at the same point of aim as the first group. It should be located about 18" higher on the paper. If its off to the left or right of the first group, then I have proof of an orientation problem and wind shouldn't be a variable.